inscription: "E. Arburala R. / Nicaragua 1987" in white at the bottom left of the image. "Art Direction: Liberation Graphics" in black vertically down the outer left edge of the image. title: El Tope en Dolores (The Meeting in Dolores)" and "artist: Edmundo Alburola" in black to the bottom left and right of the image, respectively. "(c) 1988, NCA. all rights reserved." in black at the bottom right corner. Poster printed on off-white paper. At the top is a stylized image of people gathered in front of a church watching a procession. 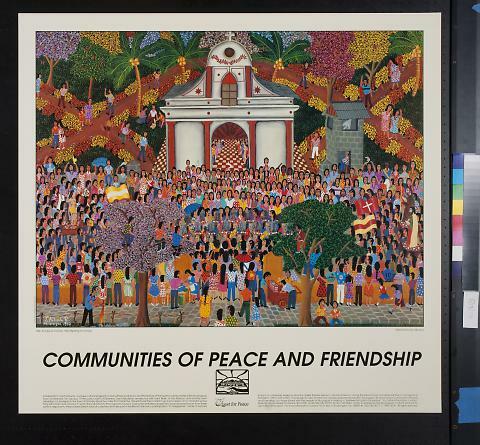 At the bottom of the poster is "Communities Of Peace And Friendship" followed by two columns of text with an interpretation separated by a Quest for Peace logo, all in black.